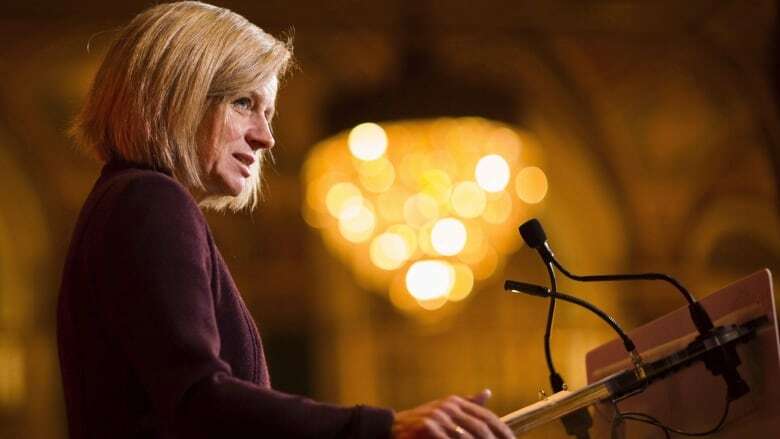 Alberta Premier Rachel Notley is expected to announce a plan for mandatory cuts to oil production on Sunday evening. Rachel Notley is expected to announce mandatory cuts to oil production on Sunday evening. The premier's office provided the following letter from Rachel Notley to CBC News in advance of her announcement on Sunday evening. First, let's look at the problem we are facing. We are in a position where we can't move our oil because government after government in Ottawa has failed to build pipelines. Existing pipelines are full. Record amounts of oil are being shipped by rail, but nowhere near enough to reduce the backlog. As a result, more of our oil sits in storage than ever before: 35 million barrels worth. With so much oil just sitting there, unable to be moved, it is being sold at fire-sale prices, around $10 a barrel. Other oil products around the world are selling for five, six times more. It's absurd, economically dangerous, and cannot be allowed to continue. The first is to let the free market sort itself out. The thinking is that companies will have to make decisions about what they can produce based on what they can sell. Some of the bigger companies, companies that are both producers and refiners, are still able to operate at a profit, even at these low prices. Many companies, though, are not and would be forced sell at a loss for as long as they can manage. Some have already had to lay people off and no doubt there would be more. Some would likely shut their doors. The second view for how we fix this is for us to intervene and temporarily restrict oil production, with a cut in production industry-wide. That restriction would remain in place until stockpiles draw down, the price gap closes and the bleeding stops. My political counterparts in both the Alberta Party and the UCP have made their positions on this issue known, and I want to thank them for their contributions to this discussion. Both Mr. Mandel of the Alberta Party and Mr. Kenney of the UCP have called for a production cut. This is a major decision with major implications. We need to be smart. That's why, for weeks now, we have been in extensive discussions with everyone involved, and have sought expert advice from many quarters. That work is drawing to a close. There are good jobs and made-in-Alberta businesses at stake. This is about more than numbers on a screen or economists talking. It's about working people, people with great skills, who have made Alberta the best place in Canada to live. No matter what, I won't stop fighting for you. CBC will livestream Notley's announcement on Facebook and online on Sunday at 6 p.m. MT.